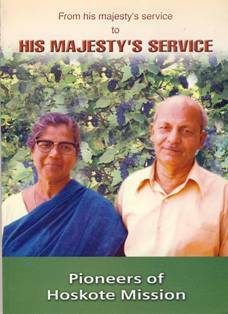 31 March, 1917: Birth of Mrs. Mariamma (Pennamma) Joseph (d.19 June 1986), Co-founder of the Hoskote Mission near Bangalore, Karnataka, India. Mariamma was the daughter of Mammen Mammen and Mariamma of Manalukalayil, Kumbanad. She did her Teacher’s Training Course (TTC) from Peringara School near Tiruvalla, after which she taught in many schools including Arrangatu School, Pullad, Perumbara School near Charal Mount; Kanjeettukara and Nedumprayar (Maramon). She had the privilege to attend the classes conducted by the CMS Missionary, Miss Kellaway (Australia) of Vanitha Mandiram. Pennamma was greatly influenced through the life and testimony of this missionary. She had an earnest desire to go for mission work in Karnataka but her parents did not allow it (according to the then prevalent customs/ norms, Syrian Christian parents were scared to send their unmarried daughters to unknown ‘foreign’ lands). However, after her marriage with Mr. M.T. Joseph, (Manon House, Maramon) her desire was fulfilled as he got the call to go to Karnataka for mission work during one of the Maramon Conventions. Because she was obedient to this heavenly call, she resigned from her teacher’s job, of a permanent income, to an uncertain future. This journey led to the humble beginnings of the Hoskote Mission.